Bhaktivedanta Manor is a Gaudiya Vaishnava temple set in the Hertfordshire countryside of England, in the village of Aldenham near Watford. The Manor is owned and run by the International Society for Krishna Consciousness (ISKCON), better known as the Hare Krishna movement. It is ISKCON's largest property in the United Kingdom, and one of the most frequently visited Radha Krishna temples in Europe. It stands in 70 acres (280,000 m2) of landscaped grounds, consisting of lawns, flower gardens, a children's playground, an artificial lake that attracts many water fowl, and a substantial car park. The house is listed Grade II on the National Heritage List for England. Previously known as Piggott's Manor, the property was donated to the Hare Krishna movement in February 1973 by former Beatle George Harrison, after the Radha Krishna Temple in central London had become inadequate to house the growing number of devotees. The donation included 17 acres of land, following which the estate was extended through the acquisition of neighbouring properties. Harrison had a close relationship with ISKCON's founder-acharya, A.C. Bhaktivedanta Swami Prabhupada, and visited him at the Manor on several occasions. Beginning in 1981, ISKCON was engaged in a campaign to save Bhaktivedanta Manor from closure as a public temple, as the popularity of the site led to increased traffic through Aldenham. After a series of court hearings and appeals, the Department of the Environment granted permission for the building of a road bypassing the village in 1996. With the improved access, the Manor hosts up to 60,000 visitors for annual religious festivals such as Janmashtami. 12th century: The Abbot of Westminster granted land at Aldenham to a Thomas Picot. 13th century: The surrounding land was owned by Lord Picot, and the place was therefore named Picot's Manor. 1884: A mock-Tudor mansion was built on the site, replacing a much older real Tudor building. 1920s: By now the name had changed to Piggott's Manor. 1957 to 1972: Piggott's Manor was a nurses' training college, run by St Bartholomew's Hospital as the Preliminary Training School. By 1972, three years after its founding, ISKCON's Radha Krishna Temple at Bury Place, in central London, was proving too small to accommodate the growing number of devotees there. The popularity of the movement had much to do with former Beatle George Harrison, who had helped establish the temple, in addition to endorsing Krishna Conscious principles in his 1970 solo album All Things Must Pass. One of the first British devotees, Dhananjaya Das, recalls Prabhupada suggesting that he ask Harrison if he would care to help with their predicament, to which the musician replied: "I would be very much honoured." Harrison began looking for a new premises but then left the search to Dhananjaya and others, aware that property owners were immediately raising their asking price due to the involvement of a celebrity musician. Dhananjaya came upon Piggott's Manor in the Hertfordshire village of Aldenham, north-west of London; he recalls that the owner had been considering using the house and 17 acres of grounds as a nursing home. Harrison purchased the property in February 1973 and donated it to ISKCON's London chapter. The devotees endured financial hardship during their early years at the Manor, due to the substantial costs involved in maintaining the large property. A habitual international traveller, Prabhupada visited Bhaktivedanta Manor in the summer of 1973 and was delighted with the new UK base. During their meeting there in August, he told Harrison: "You have given us this shelter, and Krishna will give you shelter – at his lotus feet." Prabhupada later referred to Harrison as ISKCON's "archangel" for this and other gifts to the movement; in November 1977, while on his deathbed in the Vrindavan temple, the acharya removed a ring from his hand and instructed devotees to deliver it to Harrison. Prabhupada's final trip outside India, over August and September 1977, was a visit to the UK centres at Bury Place and Aldenham. While staying at the Manor, he became too sick to undertake a planned tour of the United States, and instead returned to Bombay before being transported to Vrindavan. Harrison said he envisaged that the Manor would be a "guide to Krishna consciousness" and "A place where people could get a taste of the splendor of devotional service to the Supreme Lord". Coinciding with the 40th anniversary of Bhaktivedanta Manor in 2013, "The George Harrison Memorial Garden" was officially opened to the public. His widow, Olivia Harrison, together with celebrity gardener Monty Don and author Peter Owen-Jones, attended a private ceremony to unveil the garden on 25 May that year. A road on the property, which was earlier an unnamed track across a park, is now named Dharam Marg, which is Hindi for "the way of truth". By the late 1970s, Bhaktivedanta Manor had become a popular visiting place for London's large Hindu population, particularly since, unlike in areas of the UK such as the Midlands, it was a rare example of a local temple for Krishna worship. The 1979 and 1980 Janmashtami festivals attracted up to 15,000 visitors per day, resulting in increased road traffic through Aldenham and complaints to Hertsmere Borough Council. Having originally permitted ISKCON to use the site as a theological college, in line with the educational function that the property served under St Bart's ownership, Hertsmere Council moved to ban all religious festivals at Bhaktivedanta Manor in 1981. ISKCON subsequently acquired a property near Worcester – Croome Court – which became the movement's UK headquarters temporarily, including the site of its school. An agreement between the council and the ISKCON devotees, made in January 1983, then allowed for six days each year where the number of people attending Bhaktivedanta Manor could exceed 1000. Financial difficulties forced the closure of the Croome Court base in July 1984, however, leading to a renewed dependence on the Aldenham property. During 1985, the devotees tried to buy adjoining land to make road access to the Manor that would bypass the village. Meanwhile, the council received many more local complaints, leading it to issue an enforcement notice in January 1987 to have the temple closed to the public, citing a breach of the 1000-person daily limit. The temple submitted an appeal to the UK's Department of the Environment. A series of government inquiries over 1987–89 recognised the importance of Aldenham's position within the Letchmore Heath Conservation Area, and in 1990 the Secretary of State announced that Bhaktivedanta Manor would have to close as a temple. Appeals to the British High Court, the Court of Appeal and the European Court for Human Rights – the latter heard as ISKCON and 8 Others v. United Kingdom – all similarly failed, and a date of 16 March 1994 was set for the closure. In the months leading up to the deadline, the devotees bought the neighbouring land, and submitted a development proposal to Hertsmere Council, with a view to making a road that would bring all traffic into the Manor from the A41, on the opposite (west) side of the property from the village. On the day of the proposed closure, a crowd estimated at 36,000 marched on the British government's offices at Westminster in protest, as the council deliberated over the application for a new road. The road was duly built, through what was now a 70-acre property, bypassing the village of Aldenham. In September 1998, visitors to the Janmashtami festival numbered 60,000 – a figure described by the local Borehamwood & Elstree Times in 2007 as "the average number of people" attending the festival each year. According to a 2013 BBC News report, the grounds of Bhaktivedanta Manor now include "a theological college, organic farm, herb gardens, a cow sanctuary, primary school and kitchens providing meals for the homeless". All activity at Bhaktivedanta Manor focuses around the temple room with its altar of carved wood and gilt containing three domed shrines. The first houses deity forms of Radha and Krishna, named "Radha Gokulananda". The second houses Gaura-Nitai deities, and the third, Sita, Rama, his brother Lakshmana and Hanuman. The rest of the property comprises a shop selling souvenirs and devotional paraphernalia, a bakery, a farm with working oxen, college facilities, ashrams, a primary school, and a small theatre. The latter is used for performances of the dramatic arts illustrating bhakti yoga and stories about Krishna. The theatre is frequently used as a venue for Vaishnava religious festivals, Hindu family gatherings, general open days and civil weddings. The musician Jahnavi Harrison grew up and teaches kirtan call-and-response singing at Bhaktivedanta College. ^ Carol Clerk, "George Harrison 1943–2001", Uncut, February 2002, p. 51; available at Rock's Backpages (subscription required). ^ Clayson, pp. 268, 306. ^ a b c d "Bhaktivedanta Manor", History.UK.com (archived version retrieved 16 September 2014). ^ Elaine Law, "The Rewards of an Unusual Change in Career", RLH League of Nurses, May 2005 (archived version retrieved 16 September 2014). ^ Dwyer and Cole, pp. 31, 32. ^ Clayson, pp. 267–69, 439. ^ Tillery, pp. 88–90, 151. ^ "George Harrison and Hare Krishna". bhaktivedantamanor.co.uk. Retrieved 18 October 2014. ^ Dhananjaya Das, in "Bhaktivedanta Manor Memories – The Definitive History"; event occurs between 1:20 and 2:14. ^ a b c Dwyer and Cole, p. 32. ^ Dhananjaya Das, in "Bhaktivedanta Manor Memories – The Definitive History"; event occurs between 2:16 and 2:28. ^ Tillery, p. 111, 162. ^ a b Greene, pp. 198–99. ^ Dwyer and Cole, pp. 32–33. ^ Dwyer and Cole, pp. 34–35. ^ Dwyer and Cole, p. 35. ^ Giuliano, Geoffrey (1997). Dark Horse: The Life and Art of George Harrison (rev. ed.). New York: Da Capo Press. ISBN 978-0-306-80747-3. ^ "George Harrison memorial garden opens to the public". nme.com. 28 May 2013. Retrieved 18 October 2014. ^ Snowdon, Kathryn (17 June 2013). "Hare Krishna Temple's George Harrison memorial garden opens". Watford Observer. Retrieved 18 October 2014. ^ Dwyer and Cole, p. 43. ^ a b c d e f "ISKCON and 8 Others v. the United Kingdom" (8 March 1994). HUDOC. Archived version retrieved 17 October 2014. ^ a b c d e f g "Campaign to save the Manor". bhaktivedantamanor.co.uk. Retrieved 18 October 2014. ^ Dwyer and Cole, pp. 40–41. ^ Dwyer and Cole, pp. 41–42. ^ Dwyer and Cole, p. 45. ^ a b c Mahadevan, Janaki (6 September 2007). "Temple shines through trying times". Borehamwood & Elstree Times. Retrieved 18 October 2014. ^ Dwyer and Cole, pp. 45–46. ^ Dwyer and Cole, pp. 45, 46. ^ Taneja, Poonam (27 March 2013). "'George Harrison' Bhaktivedanta Manor Hindu temple at 40". BBC News. Retrieved 18 October 2014. ^ van Praagh, Anna (30 November 2014). "What's it like to grow up in a religious sect?". The Daily Telegraph. Retrieved 29 October 2018. "Bhaktivedanta Manor Memories – The Definitive History". Bhanktivedanta Manor – Hare Krishna Temple Watford on YouTube (18 July 2013). Retrieved 16 September 2014. Dwyer, Graham; Cole, Richard J. (eds) (2007). The Hare Krishna Movement: Forty Years of Chant and Change. London: I.B. Tauris. ISBN 1-84511-407-8. Gibson, Lynne (2002). Modern World Religions: Hinduism – Pupil Book Core (Modern World Religions). Oxford [England]: Heinemann Educational. ISBN 978-0-435-33619-6. Goswami, Satsvarupa dasa (1983). Prabhupada: He Built a House in Which the Whole World Can Live. Los Angeles, CA: Bhaktivedanta Book Trust. ISBN 978-0-89213-133-4. 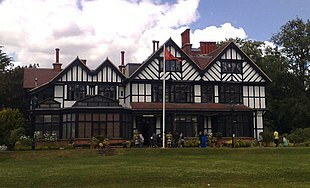 Wikimedia Commons has media related to Bhaktivedanta Manor. This page was last edited on 6 March 2019, at 20:22 (UTC).